Congratulations! 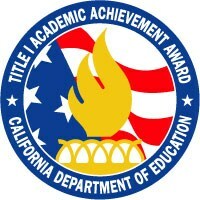 I am pleased to inform you that Woodrow Wilson Elementary School has successfully completed the California Title I Academic Achievement Award Program application process and is being recognized as one of our 772 California Title I Academic Achievement Award Winning Schools for 2016. The award reflects your school’s success in creating a positive learning atmosphere for your students. Such success is a direct result of your dedicated, creative, and talented staff, and your supportive school community.